Bagged A Bird Lately? Now You Can Turkey Hunt With The Pros! Turkey Hunting is the Fastest Growing Type of Hunting Sport in the United States and Holds The Record For The Second Highest Number of Hunters of Any Type of Hunting! Learn everything you need to know about turkey hunting PLUS we’ll introduce you to the National Wild Turkey Federation and show you how to quickly and easily find numerous free resources related to turkey hunting! Beginners Guide to Turkey Hunting is your guide to getting to know the turkey to ensure your success on the hunt! Learn what turkey tracks look like and how and when to use turkey calls and decoys! We’ll even show you how to field dress your turkey! Packed With Turkey Hunting Tips The Pros Use! Wondering what to take turkey hunting? We’ve made a list and what’s more, we’ll show you the best places to buy your turkey hunting gear, which gear to get on the cheap and the gear you may need to spend a little more on to ensure quality! Maybe you’re already an avid hunter, but just haven’t tried turkey hunting yet. If so, realize that turkey hunting is a whole new game and you’ll need to do your homework first in order to ensure your success when you go turkey hunting. Maybe you’re new to hunting altogether. If that’s the case, turkey hunting is a great place to start! Whether you’re hoping to bag your first Thanksgiving turkey or are looking to start a family tradition, this guide is for you! Not all hunters use decoys but there are situations where you absolutely MUST use turkey decoys PLUS we’ve included 7 essential tips to hunting with turkey decoys! If you’ve never called a turkey before, you’ll want to read this first! We’ve covered everything you need to know about turkey calls! Want to keep a trophy of your prized turkey even though you’re serving Tom up for dinner? We’ll show you some creative ways to use the Beard, Spurs, and Fan of your turkey! Beginners Guide to Turkey Hunting …will have you bagging birds your first time out! Should you use a bow or a gun? What are the best turkey calls? What about decoys? We’ve answered these questions and more in this must have manual! The topics listed above should give you a good idea of what to expect from Beginners Guide to Turkey Hunting but don’t think for a split-second that’s all it offers. This step-by-step guide will help you prepare for the turkey hunting trip of a lifetime! Jam packed with everything you need to do, buy, and pack, you’ll leave nothing to chance! Beginners Guide to Turkey Hunting takes you out into the woods and shows you everything you need to know about hunting turkeys! It’s time to plan your turkey hunting trip! For a limited time, all buyers of Beginners Guide to Turkey Hunting will receive a special FREE GIFT! 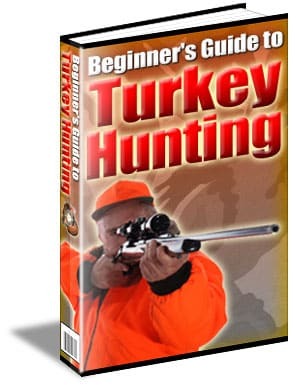 Remember, this guide covers everything from tracking your turkey to field dressing it and plucking all 4,000 feathers!